Beautiful late-summer weather brought hundreds of students, parents and players to Elkhorn's Sagewillow Farms soccer fields Saturday, Sept. 6 for the annual rekindling of the soccer rivalry between The Community School of Sun Valley and Wood River of Hailey. The white shirted Cutthroat girls had trouble keeping up with the speed of highly regarded Wood River. Here, Tanner Dredge (4 goals) of Wood River goes toe-to-toe with defender Marin Shepardson (left) of The Community School, as Nellie Brown (right) rushes to help. 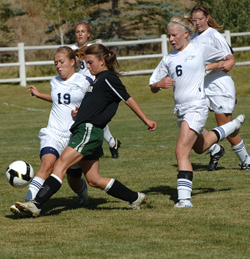 Wood River's girls won 10-0, and the Wood River boys completed the sweep 3-0 over the Cutthroats. Is an end in sight for Cove Springs issue? Skin color seems a ridiculous way to mark any human being as worthwhile or not. Whenever McCain talks reform, he quickly switches when heat from the right wing scorches.